The Cyberinfrastructure Council will hold CI Day at the MU Memorial Union Stotler Lounge on Tuesday, May 7, 2019. This year’s theme is Collaboration through Shared Infrastructure. CI Day fosters collaboration, networking, and collective problem-solving. Attendees will learn more about advanced computing technologies across a wide range of disciplines. Who should attend CI Day? CI Day is for faculty, research scientists, graduate students, post-docs, and research-support staff who use (or are interested in using) advanced computing technologies for research. CI Day offers practical information on resources, services, and emerging technologies, plus expert resources. CI Day also offers the opportunity to make your CI needs known and discuss issues of concern regarding the use of advanced computing in research and MU’s cyberinfrastructure. Registration is now open! Please register for the conference and make your FREE lunch selection. Lunch is generously being provided by Dell, Inc. While this event is free, registration is encouraged. Our sponsor, Dell, will provide a box lunch for those who pre-register. James Deaton serves as the Executive Director of Great Plains Network (GPN), a non-profit consortium of research universities focused upon connecting networks, advocating research and cultivating community. Prior to joining GPN, he served as CTO for OneNet, Oklahoma’s statewide research and education network. For more than two decades, Deaton has maintained close involvement with leaders, researchers and engineers of state, regional and national network initiatives. He serves as a board member of The Quilt, Co-Chair of Internet2’s Network Architecture, Operations and Policy Program Advisory Group, and a member of several other advisory groups and committees focused upon researcher and educator success with cyberinfrastructure. Deaton’s work with the OneOklahoma Cyberinfrastructure Initiative (OneOCII) and similar initiatives has facilitated a number of successful programs leveraging state and regional networking facilities to serve the needs of researchers and faculty at numerous institutions in the region. Dana Brunson is responsible for developing, directing, and executing Internet2’s strategy and active engagement with the national and global communities that supports the effective use and development of research cyberinfrastructure. 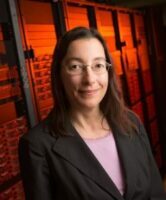 Prior to joining Internet2 in January 2019, she was Assistant Vice President for Research Cyberinfrastructure, Director of the Oklahoma State University High Performance Computing Center, and co-lead of the OneOklahoma Cyberinfrastructure Initiative. Dana continues to provide leadership for the XSEDE Campus Champion program and the Campus Research Computing Consortium (CaRCC). She also leads the Trusted CI Fellows program. She earned her Ph.D. in Mathematics at the University of Texas at Austin. Speakers and CI Council members will attend a networking lunch to share their thoughts and ideas with attendees. Dell will generously provide box lunches for pre-registered attendees. Prasad Calyam, Associate Professor in the Department of Electrical Engineering and Computer Science at University of Missouri-Columbia, a Core Faculty in the University of Missouri Informatics Institute (MUII), and Director of Cyber Education and Research Initiative (CERI) for the MU College of Engineering.